Inviting existing promoters to join a campaign should be done mostly when you want to launch a campaign for different events, like a limited time deal, a webinar or a private contest for top affiliates only. To join a campaign, promoters have to click the "Join" button and agree to any terms associated with the new campaign. Why inviting promoters instead of adding them directly? When you add a promoter directly to a campaign, we assume that the promoter agrees with any affiliate agreements you set for that campaign, that they gave you consent to process their personal data(GDPR) and agreed to receive campaign related emails. When you invite promoters to a new campaign, they need to fill any extra fields that are required for the new campaign(for ex. when they signed up to the first campaign you didn't ask for promoter's "Country" but for the new campaign this info might be required). Another important distinction is that invited promoters can get an invite notification by email. By default this email is disabled, but you can enable and customize it from the "Emails" section. If you let the email disabled, they will see the invite inside their affiliate dashboard next time they log in. The invite email is also a great way to let your affiliates know about the new campaign. If you have multiple accounts on FirstPromoter with different domains, you won't be able to add promoters from another domain directly, you can only invite them. 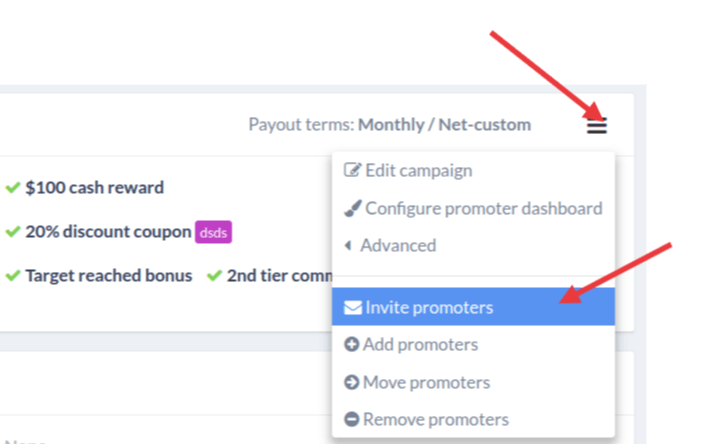 You can invite promoters in batch by going to Campaigns > click on the menu icon of the campaign where you want to invite the promoters to > Invite promoters.